Is Staying in Shape Important? 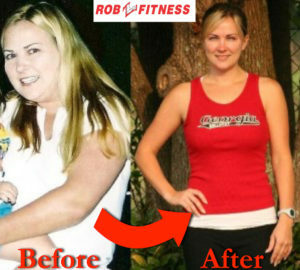 Transform from "Before" to "After"
This Is Why You Are Not Fit. You want to be fit. You know how much you should weigh. You know your ideal pant size. You can even picture how great those skinny jeans will look. So why aren’t you living life in your ideal body? There are many complex reasons that make weight loss a challenge, reasons that go deeper than simply calories-in versus calories-out. I’m talking about the life issues that get in the way of your success. Read the following 5 obstacles and the solutions to unlock your best body ever. 1. You don’t want to be bothered. It’s in your DNA to avoid pain and seek out pleasure. Unfortunately this works against you when trying to get fit. In your mind, it’s painful (or at least uncomfortable) to deny yourself the tasty food that you crave and to exert yourself with exercise. There’s a simple way to work around this obstacle: Find something painful about being out of shape to motivate yourself towards healthy eating and exercise. Focus on the negative impact your current weight has on your health, self-esteem and lifestyle. Convince yourself that the pain of being out of shape is much greater than the discomfort of losing weight. 2. You don’t want to wait for the good stuff. Just as you wish to avoid pain, you are also an expert in seeking out pleasure—namely food. This served the cavemen well, but these days it ends up as extra pounds around your waist and thighs. There’s good news: extra calories are not your only option to stimulate the pleasure center of your brain. Find an activity or two that make you smile and indulge in those regularly. You can also retrain your brain to crave the pleasure of exercise-induced endorphins. Talk about weight gain kryptonite! 3. You are crazy busy. Let’s face it, you work too much, commit yourself to too much and don’t even get enough sleep most of the time. The fast-paced way you live leaves you exhausted, stressed and hungry for comfort food. You even begin to feel too busy to take care of your health. It’s time to reprioritize. Let go of your perfectionist standards and remove a few commitments from your schedule so that you are able to cook healthy meals, exercise and get a good night’s sleep. Remind yourself that taking care of your health is not a luxury—it’s a necessity. 4. You don’t deserve it. I don’t agree with it, but you sure act like you don’t deserve to live the good life in the body of your dreams. Take a moment to think back on all the times you have self-sabotaged your weight loss efforts. If you don’t believe deep down that you are worthy then you’ll never give yourself a chance at a fit body. I believe that you deserve to have a healthy body—and I urge you to dig deep down to uncover why you don’t. Once you conquer your feelings of unworthiness, getting on an exercise and healthy eating plan will be easy. Take the time to take care of yourself. You DO deserve it. You’re afraid to start because you just might fail, and wouldn’t that be embarrassing? You’re also afraid to start because you just might succeed, and change makes you uncomfortable – even if it’s change in the right direction. Focus on all of the ways that losing weight will make your life better. Envision that better life everyday so that it goes from being new and scary to familiar and comfortable.